Can the “Granny Flat” Make a Comeback? The multigenerational home has a long provenance, going back to the “granny flat” over the garage of a detached early-20th-century home or the “in-law suite” with its own entrance in that same home. Suburban developers have responded to the trend by offering products like Lennar’s “NextGen” home, which contains a small “apartment” with its own separate entrance within the traditional single-house envelope. Urbanites, however, have yet to find this option widely available to them. But architects are working on bringing it to them. Two examples from opposite coasts show how creative minds are adapting the multigenerational model to their own cities’ housing stock. San Francisco architect Brandon Baunach began thinking about the subject when he and his wife decided to have a family. Baunach, whose work includes numerous apartment complexes for seniors, realized that even with a decent income, adding children to the mix became too much of a financial burden in that notoriously expensive city. That’s when he ran into a wall. “We found there were only two options: Buy a duplex or buy a house with an in-law apartment. But until very recently, in-law units were illegal. And with duplexes, we would have had to evict everyone in the duplex in order to take it over — and in one instance, that involved a person with an oxygen tank. “So even though we had a good budget, there was no product that would allow us a level of separation while also allowing for togetherness.” Baunach ended up having to move across the Bay to Berkeley to get the living arrangement he wanted. There’s also a personal element to Philadelphia architect Laura Blau’s effort to develop a rowhouse that can change as its owner’s needs change. “I’m in my late 50s, and the house I live in now would not be suitable for me to age in place,” she says. This stems from two major flaws in the standard Philadelphia rowhouse: Its first floor is elevated above the street and its narrow width usually requires that living and sleeping spaces be on separate floors. The solutions Blau’s BluPath Design architectural firm and BAR Architects, where Baunach works, are developing are each rooted in their own cities’ urban ecologies. BluPath’s “Transformer” house takes the standard rowhouse, doubles its width, and lowers its first floor a few feet. This makes possible the creation of an accessible street-floor apartment of about 30 by 50 feet — “a nice, comfortable living area for a couple,” Blau said. The space is large enough to accommodate a one-bedroom apartment whose entrance is shared with the unit on the floors above. It also is designed so that an elevator can be added to connect the units by inserting the shaft in utility closets on each floor. With the potential for anywhere from one to four units on the floors above, the house could also offer an opportunity for its owners to offset operating costs by renting out units until it’s time for the owners to use them. Those costs, however, are also lower by design — the house is engineered to meet passive-house standards, which means its net energy consumption would be zero or as close to it as possible. 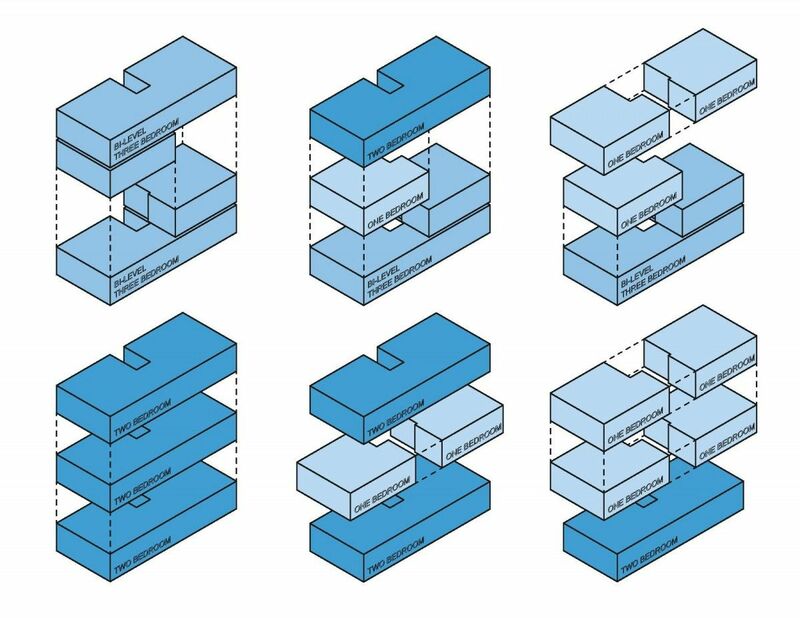 Baunach’s idea takes the concept to the world of multifamily housing — apartments and condos — by borrowing from the world of hotel design: Create two units with a common shared space that can be accessed from either unit and doors that allow the two units to be used separately or together as the owner desires. In the hotel, that space is often a living room that turns the two units into a suite; in BAR’s prototype, the common space is the laundry room both units share. “It’s incredibly basic,” he explains — akin to purchasing a studio and a two-bedroom apartment together. It also offers a more family-friendly alternative to one of the hottest trends in affordable housing, one that would allow buyers or renters to remain in the neighborhoods they love. There is another challenge to bringing these designs about, however: changing local zoning laws to allow for their existence. Similarly, Blau’s house couldn’t be built in many Philadelphia neighborhoods, where the most common residential zoning category stipulates single-family rowhouses. “To really make this work, you have to have multifamily zoning from the get-go — you can’t start as one thing then go back and fight for the zoning later on,” she says. Blau is currently seeking investors to allow her to continue development of her concept.